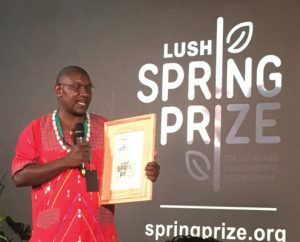 African Biodiversity Network (ABN) has been selected as a winner of a Lush Spring Prize Award in the Influence category of the 2018 Spring Prize. This award is given to organisations that are campaigning or lobbying to influence policy, regulation or public opinion in support of regeneration. This prize is aimed at supporting those who are changing the context in which we are all working; who are helping to build and strengthen the regenerative movement. The award ceremony was held in at Emerson College near London, UK, on 16th May 2018. Simon Mitambo, attended the award ceremony on behalf of ABN to receive the award. We wish to congratulate all the ABN partners who participated in the preparation of this award. 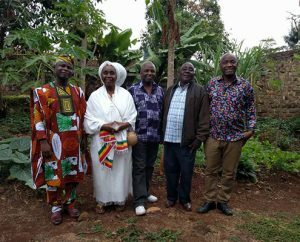 We extend our sincere thanks to our international partner, the Gaia Foundation who were part of this process in lobbying the African Commission for the legal recognition of sacred natural site through a resolution (372) and our able Chairman Dr. Sulemana Abudulai for his tireless efforts in travelling to the Banjul and representing the ABN and the Gaia Foundation. We also extend our appreciation to the Institute for Culture and Ecology (ICE) for the recommendations for the award. Finally we thank the following partner organizations for working with custodians to develop a report to the African Commission calling for the recognition of sacred natural sites and territories and custodial governance systems: GRABE Benin, EarthLore Foundation (Zimbabwe/South Africa), NAPE (Uganda), AFRICE, SALT, and MELCA Ethiopia. This award was passed in record time as a resolution 372 by the African Commission in May, 2018. This is a product of a highly collaborative endeavour, involving custodians, communities, partners and allies in our network.